What do advocates of a horse slaughter ban want? ALL WE’RE ASKING FOR is to give horses the same legal treatment and protection as dogs and cats. Dogs and cats are protected against slaughter and export to countries where their meat is eaten. The same should apply to horses. Just like dogs and cats, they are intelligent animals not bred and raised to be meat. In fact, horses are taxed differently than food-source animals. Where are horses slaughtered in the United States? There are three slaughterhouses located in the U.S. – two in TX and one in IL. There are also plants in Canada, and killer buyers purchase horses here in the U.S. and truck them over the border as a major source of supply. All three of the plants in the U.S. are foreign-owned – French and Belgian – and foreign-operated. What is the horsemeat used for / where does it go? There is NO U.S. market for horsemeat. Contrary to popular myth, horses are not used for glue or dog food. All three slaughterhouses in the U.S., as well as those in Canada, are used for the sole purpose of exporting horsemeat to Europe, where it is consumed. Since we don’t raise our horses to be sent to slaughter, over the course of their lives they will receive a wide variety of drugs, medications and vaccinations during the course of their life that would be banned if horses were intended for U.S. consumption. Aren’t the horses sent to slaughter the older, sick, or injured horses? Actually, according to 2001 field studies conducted by Temple Grandin, 70% of all horses at the slaughter plant were good, fat, or obese; 72% were considered to be “sound” of limb; and 84% were of average age. 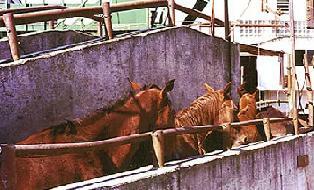 Slaughterhouses do not want sick, old horses for obvious reasons. These figures are consistent with USDA studies that reveal that 92.3% of horses at these plants are in “good” condition. How do the slaughterhouses get these horses? Horses are bought at auctions by "killer buyers" which act as middlemen for the slaughtering companies. At a normal auction at a fair or some similar forum, these killer buyers compete with civilians who wish to purchase a horse in good will for the best price. Killer buyers will also respond to ads in the paper where horses appear to be available for a price that would allow for a profit by the pound for slaughter. There are a lot of people who sell their horses at auction or try to find their aging or unwanted horse a good home who are unaware that they just sold their horse to a slaughterhouse. At most racetracks, there are periodic auctions – often at night – where horses are sold and most of them are ultimately purchased by the killer buyers. These killer buyers also make the rounds on the backstretches of tracks all the time to attempt to arrange private purchases. And finally, there’s theft. It should not be underestimated - there are 40-50,000 horses stolen in the U.S. each year and there are heartbreaking stories of people whose horses were stolen having to identify their hides at the facility where their horse was slaughtered. Slaughterhouses typically process and kill the horses they have received within 24 hours, making it almost impossible to trace and recover stolen horses in time and ultimately destroying the evidence. FACT: When California passed laws in 1998 to ban horse slaughter, horse thefts in the state subsequently dropped 40% and have continued to drop each year, despite the average price for horses at sale remaining constant. Why do you consider the slaughter of horses to be excessively cruel? Beyond the obvious, you have to understand that all of the transportation and equipment involved in slaughtering horses was designed for slaughtering cattle. Horses are transported to slaughterhouses in trailers with low ceilings where they have to hang their heads down, stand off-balance, and often fall and get trampled. These trips, especially those horses driven over the border to Canada, often take more than 28 hours. In fact, these trailers are so inhumane that they are banned for horse transport in several states – which sometimes makes the killer buyers take a different route. More importantly, the stun bolts initially used on the horses penetrates the skulls of cattle effectively but are not designed for horses…and as a result, thousands of horses are still consciously alive when slaughtered. And here’s the worst part - in order for horsemeat to be exported for human consumption, the horses must, by regulations, be ALIVE when "bled out"-a process following the supposed "stunning" in the knock box where the horse is ejected out of a bloody chute, hoisted and hung upside down by a single hind leg shackled to a chain, and slit in the throat-. This means that the horses are NOT dead upon leaving the knock box, and some are often still conscious of what is going on at this time. Horses are very intelligent animals whose fear as soon as they arrive at these facilities is well-documented. In last ditch attempts to save themselves, horses often desperately resist being herded into the areas where they smell blood and death – and workers use fiberglass rods or electric prods to poke and beat the horses into the kill boxes. Ok – so it’s cruel – but what else would you do with the “excess” of horses? Approximately 10% of the American horse population (9.2 million) die either of natural causes or need to be euthanized annually – that’s 920,000 horses for those of you who don’t enjoy math. Last year (for 2005), approximately 90,000 horses were slaughtered – so this is less than 1% of the entire American horse population and only 10% of horse deaths in the U.S. Excess? Please! Euthanasia and disposal of a deceased horse afterwards is widely available and perfectly affordable. The average cost of having a horse euthanized and disposed of is approximately $200 – less than the cost of keeping the horse fed and cared for in one month. Is the demand for horsemeat on the rise? It actually appears to be on the decline – but not at a rate acceptable to those of us who find horse slaughter an indignity to the animal raised to be your pet or athelete. In the 1990’s, there were more than a dozen horse slaughter facilities in operation in the U.S. and more than 300,000 horses slaughtered annually. In 2003,that figure has been gradually dropping to just under 66,000 in 2003. Unfortunately, the slaughterhouse in Illinois which had been burned to the ground a few years earlier re-opened in 2004, and the numbers have increased slightly since, in both 2004 and 2005. How does the existence of horse slaughter in the U.S. affect the economy? Horses are worth more to the economy while they are still alive. Horses contribute to the GDP by generating jobs for those in the industry, and consumer contributions to the economy through purchasing pharmaceuticals, vet services, feed, shoes, board, supplies, and training to name only a few things; dead horses do not even generate an export tax. How does horse slaughter affect the cattle industry here in the U.S.? American horsemeat is exported primarily to France, Belgium, Italy, and Japan, where horsemeat is an alternative to beef. This actually hurts the U.S. beef industry – Japan regulates Japanese imports of beef, but there are no regulations on horsemeat. Please check out the links below for more information, photos, and video. More information - and some graphic photos - at the Stop Horse Slaughter blog. WARNING - graphic - a Texas group has online video to compare slaughter to Euthanasia.